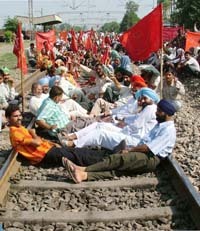 Thousands of passengers were stranded today for more than two hours at various railway stations and on the tracks as activists of the Punjab Kisan Sabha blocked rail traffic as part of their ‘rail roko aandolan’ in pursuance of their various demands from 1 pm to 3 pm. A man brutally bludgeoned his estranged wife to death with a cricket stump on a street near New Madhopuri Chowk early this morning. Despite living separately from the woman, he was allegedly trying to dictate terms to her and crushed her head when she continued to resist him. The city wears a police cantonment like look with thousands of cops headed by nine SSPs being deployed at various places under the supervision of an IG and two DIGs for ensuring foolproof security for the visit of Prime Minister Manmohan Singh in the city on September 27. Will the PM announce a new package for Punjab? Will Prime Minister Manmohan Singh give any new package to Punjab during his two-day visit to the state on September 27 and 28 in the wake of the failure of the Punjab Government to implement any of the projects announced by him during his visit to Amritsar during the 400th anniversary celebrations of Guru Granth Sahib on September 30 last year. Prime Minister, Dr Manmohan Singh will inaugurate three projects at Guru Nanak Stadium during his visit to the city on September 27. Besides, he will inaugurate a chain of cold storages of Fieldfresh Foods Pvt Ltd owned by Bharti Enterprises. Bashir Mohammad, a resident of the local Batta Bagg, who once used to floor wrestlers in the blink of an eye, is feeling helpless, as his family had to discontinue his treatment of oral cancer for want of money. Journalists have a brief of remaining objective while covering an incident. But sometimes one group becomes so oppressive on the other that the journos have to step in. If not to attack, then at least to defend. This is exactly what two journalists did by saving girls from police batons on the PAU campus the other day. The journos drew huge applause all around for their bravery. The Deputy Commissioner, Mr Ashok Kumar Gupta, yesterday launched a special drive to check the ongoing process of issuing new voter identity cards (VIC) to the remaining voters and to make required corrections in the already issued VICs in the district. The drive was launched at Daipee village in Kila Raipur Vidhan Sabha constituency. A milk vendor was caught mixing water in milk containers at Pakhowal Road here yesterday by the Civil Surgeon, Dr Yash Pal Singla, who called health officials to collect samples. Mr Ashok Gupta, Deputy Commissioner, has asked the municipal corporation to shift the statue of martyr Kartar Singh Sarabha on a priority basis. Earlier, Mr Parminder Mehta, secretary, Punjab Pradesh Congress Committee, had urged the district administration to shift the statue to some suitable place to maintain the respect and dignity of the great martyr. Ms Ramandeep Sharma, whose father was killed by militants at Bassian village, near Raikot, 14 years ago, has sought intervention of the higher authorities, including the Chief Minister, in getting job under the category reserved for terrorist victim families. She had applied for the post of primary teacher in Sangrur district but the authorities showed ignorance about such reservation. Residents of Kitchlu Nagar today said they had erected gates in their colony only to protect themselves from chain snatchers and thieves. Addressing mediapersons, the residents showed documents pertaining to the decision taken by all of them to put up gates in the colony. Maninder Kaur, a married woman of local ward number 7, who was admitted to a private hospital in a badly burnt state 12 days ago, succumbed to her burns and her body was cremated at Ludhiana yesterday evening. A sub-inspector has been chargesheeted after nine years for kidnapping, murdering and causing disappearance of evidence. 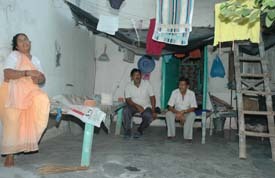 The victim, Gurcharan Singh, was kidnapped from here. The Khalsa Institute of Management and Technology (KIMT) organised a workshop on ‘Assembling of Computer Systems’. Mr Satbir Singh, Centre Manager and Mr Kanwaldeep Singh, Senior Marketing Executive, JetKing, explained various aspects related to the assembling of computer systems to the participants comprising MCA and BCA students. An exhibition, “Confluence of science, modernity and art”, was organised at Om Parkash Bansal Modern School, here yesterday. The Fatehgarh Sahib district police chief, Mr S.K. 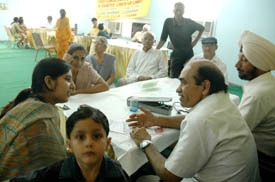 Verma, inaugurated the exhibition. More than 100 lawyers have demanded the cancellation of the allotment of chambers to the non-practising and taxation lawyers. They have submitted a representation in this regard to the president of the District Bar Association, Mr Naval Kishore Chhibber. While most of the focus on coronary artery disease (CAD) nowadays is on the treatment of severe CAD, mainly where the condition has already settled in, the stress ought to be laid on primary prevention of the disease by way of detecting the same in early stages. According to the World Health Organisation, cardiovascular diseases, such as heart disease and stroke, are the leading cause of death globally, killing more than 17 million people in 2005. Jubilation and distress have come knocking together on the doors of a noted Indian badminton player Raj Kumar here. On one hand, the 15-year-old shuttler is on top of the world at being selected in the Junior Indian Team for the Asian Badminton Championship.